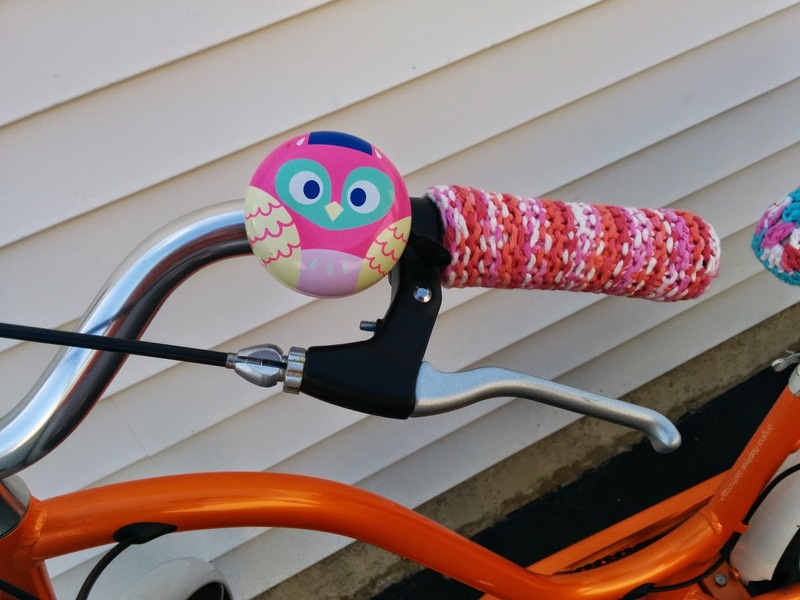 I was inspired to add some personality to my bicycle after reading "Craft Bomb Your Bike" by Shara Ballard. 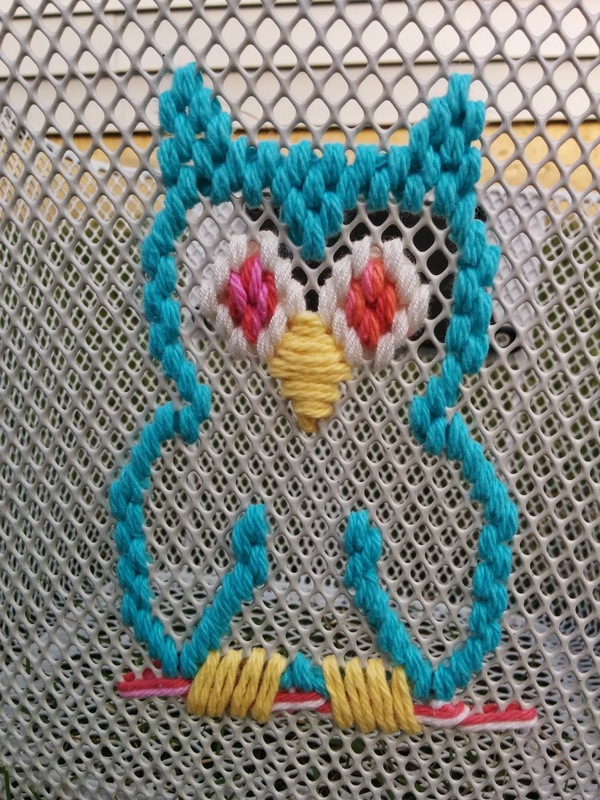 There are contributions from different crafters so there is something to inspire everyone, whether you sew, knit, crochet, embroider, or something else. Some projects are just decorative, and many are useful. I bought a plain white Bell brand bike basket years ago, along with a white package carrier and fenders to give it a more European/vintage look. The basket can come off and be carried so it's very handy when I ride to the grocery or farmer's market in Canal Winchester. The handle is just a thick piece of wire and it cuts into my arm when I carry something heavy. I crocheted around it to give it some padding. 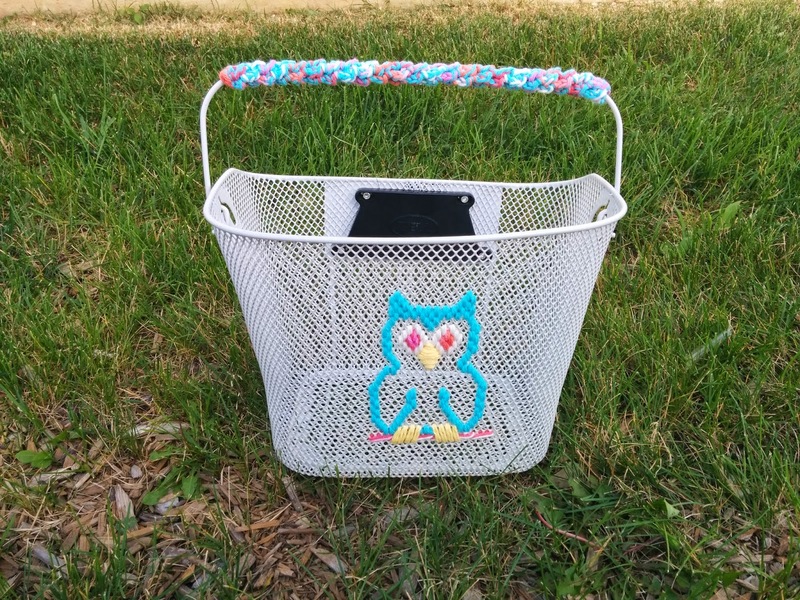 The metal mesh basket material reminded me of plastic canvas so I embroidered an owl using cotton yarn left over from other projects. If you would like a better close up photo so you can make your own, just let me know in the comments. There are many cute basket options now; I especially like Nantucket Bike Basket Co. classic wicker designs. 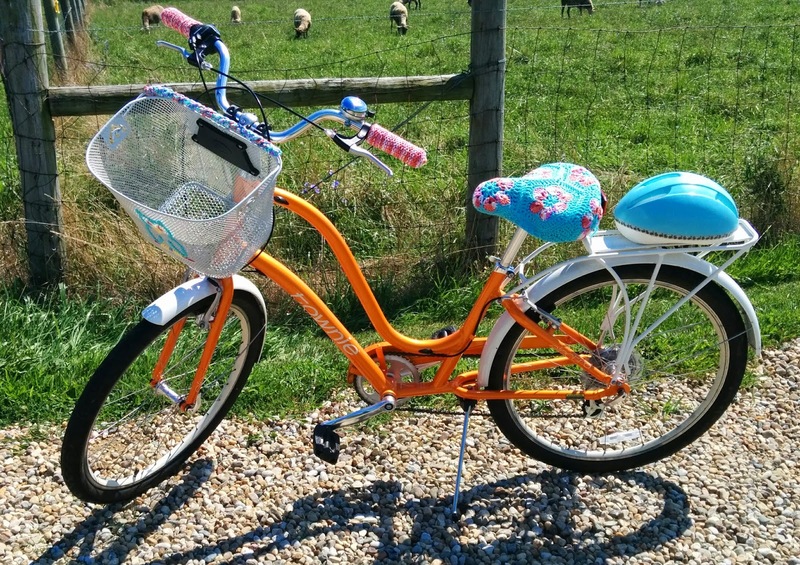 If I need more storage options in the future I might add a basket to the package carrier, or sew fabric panniers. For now I just keep an orange bungee cord looped around the back, ready for action. I used the same sky blue and striped Sugar 'n Cream cotton to make six African flower motifs for my seat cover. These hexagons lend themselves well to 3D shapes. Heidi Bears has an excellent tutorial on her blog with more information about these simple, yet high impact design. 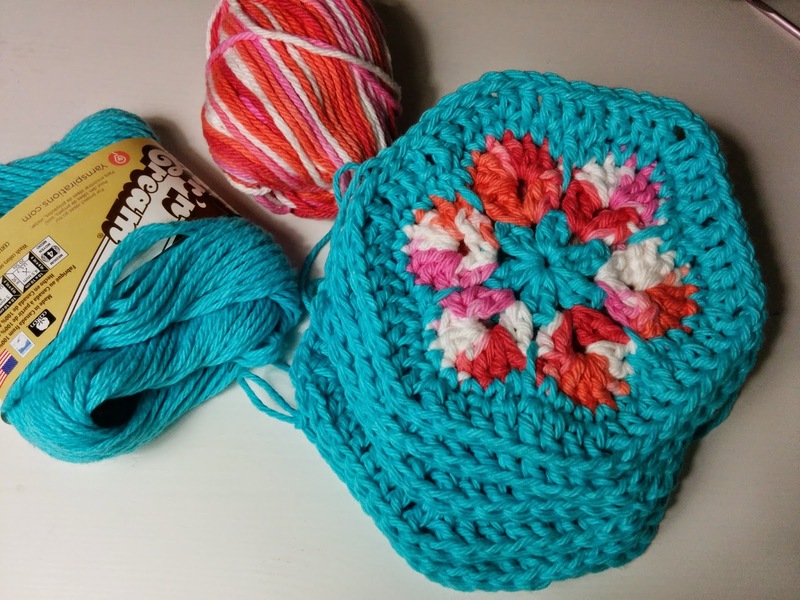 I love this motif so much I'm planning to make an afghan to use up all my worsted weight leftovers. with solid color double crochets, then double crocheted a few rounds around the whole thing, and finally threaded a long crochet chain through the edge to make a drawstring. I'd hoped it would give me extra padding but I didn't notice much difference. I'll probably add a layer of foam underneath for a more comfortable ride. Cushy knit garter stich grip covers are just the thing to spare my hands from post-riding aches. I added the pattern to Ravelry here. They were a quick knit and a success! 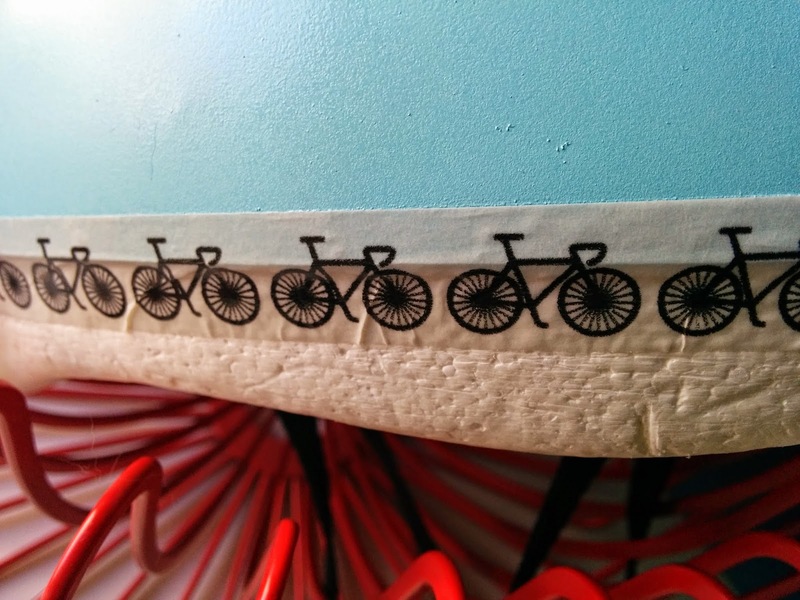 I already have a request from someone else for a pair for their bike. I'm debating about adding a tassel to get the long streamer effect. Remember those? I had some on my banana seat bike back in the day. I adore this cute owl bell one of my sisters gave me. She found it second hand and it coordinates with my other accessories perfectly. There are many cute bells available online like Kikkerland's octopus bell here. Or you could buy a plain bell and paint it, cover it with Duct tape, or crochet a pretty flower shaped cosy. My helmet need a makeover, too. It was already pretty scruffy when I picked it up at a thrift store for a couple bucks. I decided to spray paint it with aqua Rustoleum paint, so I peeled off the tape holding the plastic shell to the styrofoam base. Paint and styrofoam don't mix very well in many cases, and I didn't want to risk ruining my helmet. A couple of quick coats and I used Scotch printed tape to stick the shell back on. I'm not sure how well it will hold, but I'll replace it with mini Duck tape if needed. Have you seen those mini rolls? They're so useful! Plus it's nice to have a smaller option instead of trying to tear long strips from regular tape, which always leaves a stringy, stick edge. Here's a pic of the whole project. The local sheep weren't appreciative-they scampered away when I pulled over. 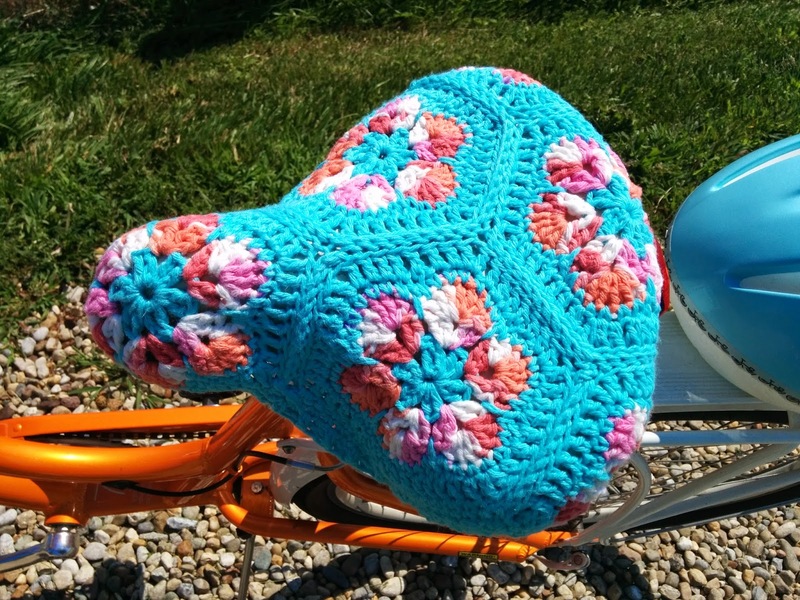 I'd love to see pics of your bicycle, car, or other craft embellished conveyances. Comment below, or send links via facebook or Pinterest.